I've been staying away from Iron Man 3 trailers, as I stay away from most trailers these days, because I like to enjoy the best parts of a movie when I actually see the movie for the first time, thank you. So I missed the apparent point in this upcoming flick where Tony Stark changes from Iron Man into a Transformer/90s anime star, and starts looking even cooler. 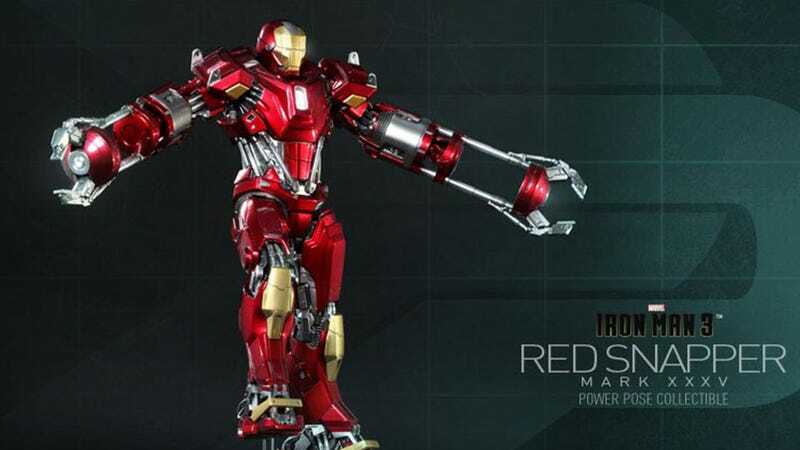 This is a figure of the Iron Man - Mark XXXV "Red Snapper" suit. It's by Hot Toys, so you know what to expect: lavish detail, hefty price-tag ($255). He'll be out in December.